Large pores are primarily determined by genetics, but trapped sebum and weak collagen in skin play a part, too. Pores tend to widen as you age, and unfortunately, there's no way to make them small again. Foundation can cover up pores, but the wrong products make them look bigger. The best foundations minimize pores and give your face a flawless look. If you have large pores, skip the liquid or creamy foundations. These products can make skin look oily and clog pores. Matte-finish liquid foundations may exaggerate wrinkles or make your skin feel dry. Light-reflecting foundations make pores look bigger. Your best bet is a powder foundation, such as mineral powder, applied over a layer of makeup primer. The primer creates a smooth surface on your skin. Mineral powder stays on the surface instead of settling into pores. Mineral makeup also absorbs moisture, so it's ideal for oily skin. Powder and mineral foundation come in pressed and loose forms. In general, pressed foundation offers better, more complete coverage. Loose powder provides a softer look and lighter coverage. To pick the best shade for you, apply foundation on your jawline near your neck or on the skin between your thumb and wrist. Choose the shade the most closely matches your skin tone. If you have acne or discolored spots you'd like to hide, opt for a foundation that's one or two shades darker than your skin color. After washing, smooth a thin layer of makeup primer over your entire face. 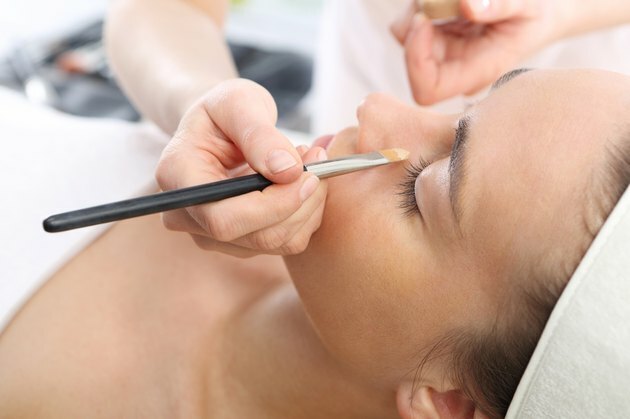 If you have pimples or undereye circles, use a small amount of mineral concealer to hide them. Dip a kabuki brush into the powder foundation and then press the back of your hand against the bristles to push the powder into the brush. Tap the brush on the foundation container to shake loose excess powder. Apply the foundation to your face using firm pressure and circular buffing motions. Start applying the powder on your forehead and work your way out. If desired, brush skin with a mineral finishing powder -- it helps foundation stay on longer and minimizes pores. Exfoliating can brighten skin and make pores look smaller. If you have oily skin, wipe your face daily with a glycolic acid or salicylic acid cleanser. Glycolic acid wipes away dead skin cells and pore-clogging oil. If your skin is normal, use a gritty scrub and brush skin with a damp, nubby washcloth or exfoliating glove. Nose strips or pore-purifying strips can help dirt and oil from pores, so they'll look smaller. Opt for strips that contain witch hazel, a pore-tightening ingredient.